We are proud to be a 2018 recipient of the HHCAHPS Honors award! This prestigious national award certifies that our patients are extremely happy with the care they receive from A Plus. Please click here to read more. Become an Facebook fan of A Plus Home Health Care, Inc.
A Plus Home Health Care can provide many health care services in the comfort and safety of your own home. These services can be provided when an individual or a family member is in need of specialized treatment, personal care assistance or just needs a rest from caring for a loved one. 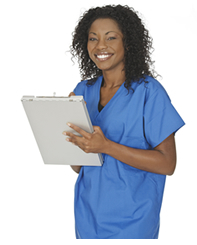 A Plus Home Health Care is a leader in home health care in Northwest Indiana. We can offer a list of home services that allows you or your loved one to remain at home and still receive the health care that you need and deserve. We are a highly respected and award-winning home health agency catering to the health care needs of our clients. We only employ nurses, therapists, home health aide, and medical social workers with experience and a dedication to make a difference. Patients with original Medicare can receive our services with no out of pocket costs. We are inviting you to experience why we are a trusted name in home health care. Please send us a message.